I started hearing things about a natural gas boom from the Marcellus Shale in Northern Pa and Southern NY. I then decided to build my own welding rig. I started eBay things like a Lincoln 200D pipeliner, victor torches etc. I also was looking around for a 6x6 truck. This took a year but, I came across a 1996 Chevy Dually 3500 with a new 454 in it. The gas prices where around $4.50 a gallon. His asking price was $5800.00. I got him down to $3000.00. I took the old bed off and sold it on Craigslist. I then started buying tube steel and 12 gauge sheet metal. The truck frame has been blasted and painted from the cab back. 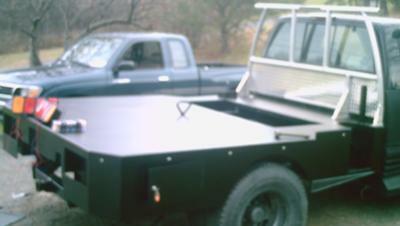 The bed rails are 2x3 tube steel which match the frame rails on the truck. welder/fabricator/ironworker that is collecting UC benefits. I am signed up for API 1104 Down-Hand Welding Level I and II courses at a local college come January 2010.